Trump Renews Shutdown Threat Over Border Wall, McConnell Says No Bill Until After Midterms [VIDEO] - Joe.My.God. Trump has repeatedly threatened not to sign funding legislation if Congress fails to include enough money for a wall on the border with Mexico. Trump reiterated that threat late on Wednesday. His stance contradicts an interview he gave to the Daily Caller on Tuesday, when he said: “I don’t like the idea of shutdowns.” “I don’t see even myself or anybody else closing down the country right now,” Trump was quoted as saying. Senate Majority Leader Mitch McConnell (R-Ky.) said Wednesday that he expects a fight over funding for President Trump’s border wall to happen after November’s midterm elections. 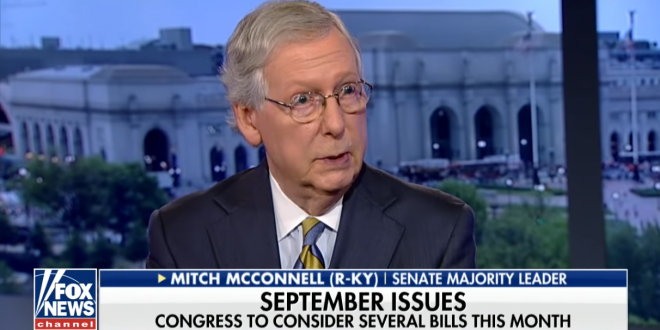 “The nine bills that we’re going to put on [Trump’s] desk before the end of September, which is the end of the fiscal year, deal with other substance but also 90 percent of the federal budget will have been approved before the end of the fiscal year,” McConnell said during an appearance on Fox News Wednesday evening.